We attach extreme importance to the satisfaction of our reputed patrons and attribute all our efforts to offer unmatched qualitative designer Suit, Saree, Lehenga Dress, Kurti and Indowertern. Our business policy is to ensure to use the superior grade quality raw material to design our offered saree. Further, we make sure that the producs are timely delivered with perfect packaging to the patron preferred location. Quality Assurance, QA, is a planned and systematic way of creating an environment to assure that the product being developed meets the quality requirements. 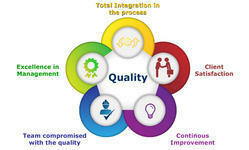 QA refers to the implementation of well-defined standard practices and methods. It is a pro-active quality process. This process is controlled and determined at managerial level. Quality assurance focuses on the process checklists, process standards, project audits, methodology and procedures for development. It is a preventive process that aims at establishing the correct methodology and standards to provide a quality conducive environment to the product being developed. In this sub process, quality assurance plan is created for a particular productt. In the quality assurance plan, organizational standards are selected which are applicable to a product. It should also involve the plan for quality control. Quality assurance planning details out what QC activities are performed, when the QC activities are performed and who will perform those. It also contains details of resource required, tools and techniques to be used for performing quality control. Quality Control, QC, is the set of activities that control the quality of product being developed by identifying any defect that might be present. Quality control process is a subset that falls under the quality assurance. It is a corrective process. The task of actual testing is performed to find out and identify the defect present in the product. The defects are raised, who then try to fix them. After fixes, the product is verified again such that the functionalities and features are working as required. QC process assures that that the product being developed is of the required quality. Examples of quality control activities include inspection, deliverable peer reviews. Quality improvement is a formal approach to analyse the feedback received from the quality control team. In this process efforts are put systematically to identify any room of improvements in the existing standards and procedures. The target is to improve the process that establish the standards of quality in the organization.